I received this [tag]drill[/tag] for [tag]better basketball better shooting[/tag] from Ross– fast-paced and all inclusive for skills. Give this one a try and watch performance sky rocket. When I get 20 plus [tag]basketball[/tag] players on the floor, the wait to get a chance to play gets discouraging for some players. To break the monotony and get some excitement going I split the players into 2 equal teams where everybody gets to play at once. Each team has to be split up again and has to go to the other side of the floor and cannot physically pass the halfway line. So while they’re playing [tag]defense[/tag] on one side, their teammates on the other side of the floor may be playing [tag]offense[/tag]. 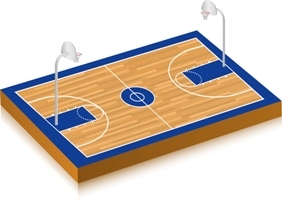 If they get a defensive steal or [tag]rebound[/tag], they have to get it to their teammates on the other side of the floor so they can try score. No [tag]dribbling[/tag]. If you score, the defense has to inbound the ball and get it to their teammates on the opposite side. In any of these situations, defense doesn’t stop, so if the opposing team steals the ball, you can still try getting it back while they’re trying to get it over half court. I usually start with 2 basketballs but if more people show up, I’ll throw an extra one in. It is non-stop action and the players learn how to move without the ball and always pay attention. You need 1 ref at either side and 1 to keep score.